People are creatures of habit, especially lawyers. If you're looking to switch out your default mode of investing, here are some ways to overcome your autopilot. I can predict your future wealth building success based on your default choices. It’s not because I have some extraordinary power or special insight into investing. It’s because human beings are a creature of habit. We do the same things over and over again. And if the human family is a create of habit, lawyers are a special breed when it comes to risk-aversion and preference for the doing the same thing each time. Have you ever seen a contract that says “NOW, THEREFORE, in consideration of the premises and mutual promises herein contained …”? Have you read articles about why it’s unnecessary? Do you still include it anyway “just in case”? Our default choices are powerful. And often more powerful than we understand. Which means if you can override your current defaults and set up new patterns, it’s like launching yourself on a rocket ship of success. Sure, the results take some time to materialize but time goes by fast. Trust me. You’ve probably heard that Fidelity conducted a survey of their accounts and the ones performing the best were owned by dead people. Ron Leiber at the New York Times did a little digging on that story and it turns out Fidelity never conducted such a survey. That’s a shame, since it’s probably true. Setting up an appropriate asset allocation and paying as little attention to your 401(k) as possible is a recipe for success. It turns out that it’s hard to get going but once we do we’re hardwired to go with the flow unless we receive compelling evidence to the contrary. Richard Thaler, an economics professor at the University of Chicago, won the Nobel Prize in Economics this year for his work in behavioral economics. Paul Krugman, the 2008 winner and New York Times columnist tweeted his delight. You may know Richard Thaler through his work on Nudge, the book he co-authored with Cass Sunstein in 2009 that examined how we make decisions. If you haven’t read it, it’s a great look at how so many actions that we think are “decisions” are in fact simply default choices or illusions. We’re trained to think that the world is full of rational actors acting in their own best interests when in fact most of our day is spent on auto-pilot sub-consciously trying to avoid decision making whenever practical. In its most basic form, the concept of the default choice is unlikely to be controversial. The most popular background is the one that shipped with your MacBook. The most likely ringtone of your office phone is the one that it came with. Why is the default choice so popular? It could be because the choice doesn’t matter. The ringtone works on your phone, so you use it. The background of your computer looks fine, so no need to customize it. It gets a little harder to explain when you realize that 401(k) enrollment follows the same pattern. Deciding whether or not (and how much) to contribute to your 401(k) is a life-altering decision. Yet, reviews of various programs show that participants are far and away more likely to stick with the default option and asset allocation. Presumably if HR thinks it’s a good enough plan, why would you mess with it, right? Unfortunately, at this point you’re probably thinking that the power of the default is powerful but it doesn’t effect you. You’re a rational actor, the kind that reads finance blogs, so this stuff is not something that really impacts you. I know I’d be feeling the same way. So let’s follow a little thought process. Google is a great search engine. That’s probably why you use it. You have a question and it provides the answer. It’s also your default search engine. Google is extremely aware of this. They pay millions (and possibly billions) each year to ensure that Google is the default (thanks to Consultant’s Mind for the link). So, did you really pick Google or did they pick you? Have you spent hours comparing its results to DuckDuckGo and made the choice of the best search engine or has Google always been good enough with no compelling reason to change? I’m going to assume the latter. Next, if you do a google search for investing, you’ll get some suggestions (i.e. default choices) from Google. If you didn’t see them in the main image, here they are again. 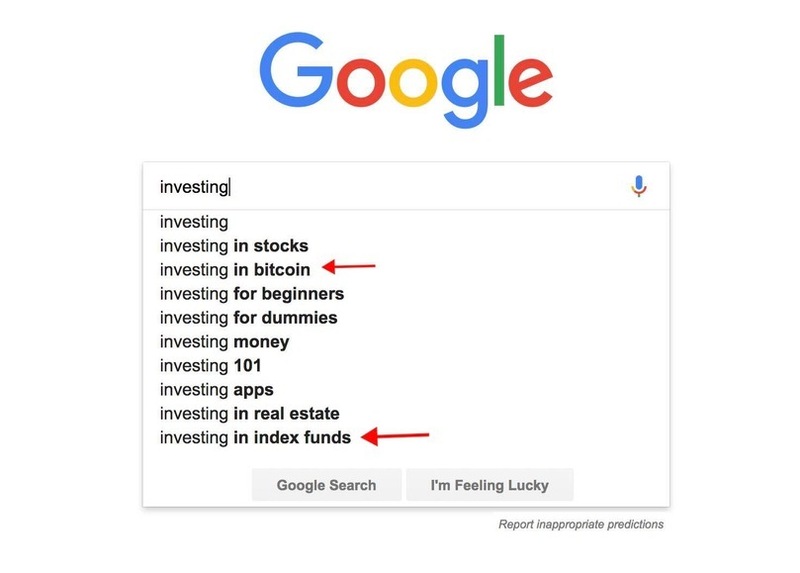 Notice how investing in bitcoin is the second option and index funds are last? You can’t pretend that you’re not influenced by those results. It makes you want to investigate bitcoin as an “investment” option even if it’s nothing more than speculating on the latest tulip craze. I’m asked about bitcoin and cryptocurrencies all the time. Now I know why! 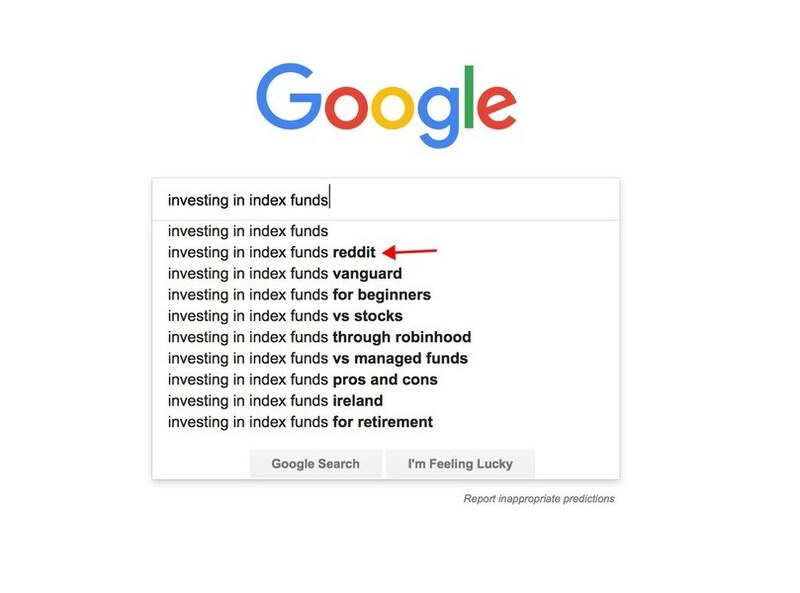 Even if you finish typing in “investing in index funds” the default choice is to see what Reddit is saying about index funds. I have nothing against Reddit but I think even Reddit users would tell you it might not be the best place to find advice about index investing (Reddit being a place with lots of conflicting information). Yet, thanks to the default choice I’m sure thousands of people end up on Reddit for that exact topic (something like 33% of all Google searches result in clicking on the first link). If you’re looking to override your default choices, there’s a lot that you can do. First, you can change your current default choices. All it takes is a little bit of brainstorming and some creativity. If you’re default is no 401(k), Roth IRA or HSA, you can change that by opening those accounts and starting with a minimal contribution. If your default is $X paid to your checking account each month, well you can change that too. Take advantage of the power of default choices by making a few consciously. You can always reevaluate in a couple of months if they’re not working for you. Second, expect resistance to the idea #1. If you read something about changing your default choices and then immediately started reading the second item in this list, that’s partially a factor of resistance to making changes to default behavior. Expect that resistance. It’s hard work to change the default. You have to do some research. You have to make a decision. That decision could be the wrong one. It seems so much safer to just keep moving forward with the status quo. Know that there will be some resistance and figure out a way to overcome it. Third, look for ways to opt out of default choices. Everything you own, buy or sign up for comes with a default setting. Look for ways to change those options. By looking, you’ll consider different possibilities and adjust accordingly. Fourth, use default choices to your benefit. Admittedly this is similar to #1 but if you recognize that you’re more likely to make the default choice yourself then set up the default choice to be something that you want to be doing anyway. Want to save $100 extra a month but literally can’t save it because there’s nothing extra for you to save? How about a $1000? Set it up so that $100 or $1000 is saved automatically. The first few months you’ll just end up transferring those “savings” back to your checking account but before long the “default” choice may win out. Let’s talk about it. Any other ideas on how to handle the power of default choices? I like this way of thinking. For things like saving, we definitely just default into spending mode first. If you default into saving, amazingly, you’ll just figure out how to make do with the smaller pie. I know that in my own life, I keep saving money by default, and every time, I still find that I’ve got plenty of money left over, even though I keep taking pay cuts. I like your recommendation to reset the default. Automating your finances seems to work under similar criteria, you set the default as automatic and then stop changes. I hadn’t thought about it in the context of defaults. I really like your fourth action item – using your default choices to your benefit. It might take some effort upfront, but in my experience it becomes so much tougher to backtrack after completing those first few steps. Companies recognize this psychological element; that’s why they work so hard to get people to sign up for free trials. Once a consumer signs up for an account, they’ve essentially changed their default setting from ‘no account’ to ‘account-holder.’ At that point it takes deliberate thought and action to flip the default switch back to its original off position. Aww man! I was sure that Fidelity study was a thing. It makes so much sense! This same concept is increasingly being applied to 401(k) plans where new participants are enrolled by default and even have their contributions increased by an annual % until max is reached. Any business owners should consider a similar feature on their plans. (By the way, I worked for Fido for 20+ years and the dead client performance story was promoted by the self directed brokerage folks but summarily dismissed by the SAI/FMR types, aka the money managers). The power of default continues to impress me. Richard Thaler won the Nobel Prize in Economics this year thanks to his work in behavioral economics. I believe Nudge covers that point about 401(k) plans. Its amazing how much google controls us indirectly. This is why the value of SEO is so high. Yes, so true. Once you understand SEO you understand why Google is such a valuable company. I can relate to this type of thinking. Being a creature of habit, there are so many default settings in my life. It is no different white how I invest and when I invest. Change does not occur easily. I saw an article titled, “Should Retirees Consider Investing in Bitcoin” or something like that and it was actually serious – not The Onion. I can’t believe that people are writing articles about “investing” in bitcoin. It’s purely speculative with no cash flows to back it up.